As you enter the nursery or garden center, you look around at the selection of plants. You may know the kind of plant you are looking for, or you may just browse until you find the flower or plant that rings your bell. That is usually the easiest part of your decision. Now you must decide which specimen, out of the dozens on the bench, you want to take home with you. There are several aspects that you should consider in making your decision. The prettiest plant on the shelf is not necessarily the healthiest, nor the best buy. Today you can purchase plants almost anywhere. You will find them in your neighborhood grocery store, discount warehouses, or even at a garage sale. To me, this is somewhat like going into a car dealer to buy a cake. This is not to say that the plant you pick up outside the local grocery store won't be healthy, nor that a nursery plant will be in good shape. However, when you shop for plants at a nursery or garden center you are dealing with people who have grown that plant, and (hopefully) know how to care for it. Regardless of where you do your plant shopping, there are a few things to watch for to ensure the quality of your purchase. Take a look at the general health of all of the plants in the nursery, not just of a particular variety. If you see very many sickly looking plants, I'd recommend heading on down the road. Better safe, than sorry! Unlike the seasonal stock of annual and perennial plants, you will often find that house plants may reside in the nursery for a year or longer. During this time they may be exposed to many common house plant pests. If you find spider mites, mealy bugs, or any other harmful insects anywhere in the house plant department, they may have already infested the plant you like as well. I'd recommend heading on down the road. Once I have decided on the type of plant I want, I generally choose about a half dozen of the healthiest looking plants, and set them off to the side. Then I will go back for a closer examination of the different parts of each plant, before making my decision by process of elimination. Look closely for insect pests and signs of disease. Avoid tall spindly plants. A short bushy plant will transplant easier and is more likely to grow into a nice specimen. The roots provide the food for the plant, and are of the utmost importance. It is essential that there is a healthy, robust root ball which fills, or nearly fills the planter. On the other hand, you don't want a root system which is compacted into the pot so densely that it is choking itself out. It is inappropriate to remove the plant from the pot yourself, but if you have doubts about the condition of the roots, you may be able to convince the nurseryman to do it for you. Normally, you can look at the drainage holes in the pot and get a pretty good idea of what is going on inside the pot. A few (but not too many) roots should be beginning to poke through the drain holes. These roots should not be dry or brittle. No roots should be showing above the surface of the soil. The stems and trunks will determine the shape and fullness of the plant. The main stem(s) should be thick and healthy in appearance. I feel that it is better to have four or five main stems and just a few lesser branches, than to have a mass of small branches with one big stick in the middle. Look for abrasions, breaks or other stem damage which may be slowly killing the plant. The foliage should be clean and show no signs of wilting. The leaves should appear to be strong and healthy, and the foliage color should be bright. Flowering plants should have fresh, tightly formed buds. It's nice to see the plant in full bloom, but if it is fully flowered now, you may not see it bloom in your garden until the following year. This is especially true with Rhododendrons, Azaleas and other flowering shrubs. 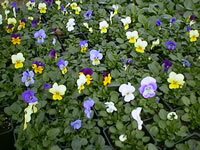 Some perennials and most annuals have an extended blooming period, so with these plants this is not a major concern, but should be considered. and then gradually bring them into their proper lighting. Be sure to keep them well watered until they are ready to plant into the ground. It is best to plant them in the garden on an overcast day.